ESPN Wide World of Sports invites you to runDisney at the 2011 Disney Wine & Dine Half Marathon Weekend! Run, eat and enjoy fun at the after-hours exclusive party for marathon runners inside 2011 Epcot Food and Wine Festival. Check out our Step-by-Step Guide to the Wine and Dine Half Marathon Weekend here. Celebrate Epcot’s International Food and Wine Festival after racing through the Disney parks! While racing at night, you’ll have Disney entertainment to cheer you on. As you strive to break your own personal record, you’ll race towards an exclusive party held in Epcot where you can proudly show off your medal! 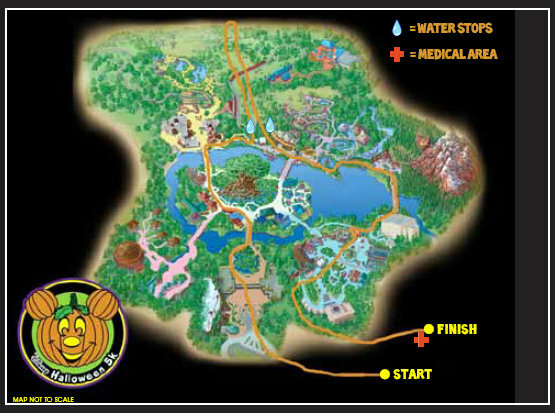 Your 13.1 mile race begins at the ESPN Wide World of Sports Complex and winds through Disney parks to finish at Epcot. The Disney Wine and Dine Half Marathon is run at night where you’ll enjoy entertainment along the course. After, join the Finish Line Party at Epcot’s International Food and Wine Festival where you’ll enjoy fabulous food, beverages, attractions, characters and entertainment. Your family can join you too! Share the 13.1 mile course at the Half Marathon Relay! This relay is for those runners that want to work as a team. The first runner will race for 4.8 miles and your relay partner will finish the last 8.3 miles. Together, you’ll receive medallions at the finish line and then head off to the exclusive after-hours party inside Epcot. Enjoy many of the kiosks from Epcot’s International Food and Wine Festival along with popular rides and character greetings! The 2011 Disney Wine and Dine Weekend Family Fun Run 5K is for all ages including children in strollers! Race through the breathtaking Animal Kingdom park to the finish line where you’ll receive medals and refreshments. Along the way, enjoy Disney entertainment. Your littlest runners can take part in these races for ages 8 and younger. There’s even a race for crawlers! After the Disney 2011 Disney Wine and Dine Weekend Kids’ Races, children can proudly wear their medals and enjoy after-race refreshments. It all takes place at the impressive ESPN Wide World of Sports complex. Not running? Don’t forget to grab a ticket for the 2011 Disney Wine and Dine Half Marathon Finish Line Party! Just steps away, runners can toast their accomplishment in the Finish Line Beer Garden. Inside Epcot, you’ll want to sip and eat your way around World Showcase where kiosks from Epcot’s International Food and Wine Festival will be offering thirst-quenching drinks and tasty eats. You’ll find even more food and beverage around Epcot as you explore the select attractions open for this private party. Stop by Soarin’, Maelstrom and The Seas with Nemo and Friends. Live entertainment will keep the party going until 3:00 a.m. Show off your medal at character meet ‘n greets for fun photo opportunities! Best of all, with pre-purchased tickets your friends and family can join in this exclusive after-hours party. Cheers!